PS: The paperback version is 8"x10" in size. The 3-ring notebook, CD/Flash and download are 8.5"x11" in size. Both sizes contain the EXACT same information. The paperback version is just slightly smaller in size to make it easier to hold while reading. Since it is smaller in size, it holds less words per page and that means it has to have more pages to still contain the EXACT same information word-for-word. **The Download is not an "instant" download. This is because people (hackers) were digging through the website code in order to get the download for free, but I will send you the link as soon as I notice the order was placed, which can be within a few minutes or hours or the next business day at the latest. Please send me an email after your order asking for it then I can reply to your email and you should get it quicker. CHECK your bulk or spam folder for my email. Download is nearly 2 megs. You can also call me to let me know you placed an order. Paperback also sold at: Amazon, Barns and Noble, CreateSpace. This is Volume V (replaces volume I, II, III and IV). This is a NEW and improved version V. This book is the main course of a training system, it is a 289 page paperback book updated for 2017/2018 and beyond. The most common judgments you can collect are from Small Claims Court, and a common type is the Landlord VS Tenant judgment but there are so many more. This bad economy creates more judgments every day. I would like to welcome you to the exciting business of judgment collections. Whether you are doing it to collect judgment owed to yourself OR you want to make money helping others collect money owed to them. By purchasing this system is your first step into this lucrative way to make money from your home or from an office. Collecting money judgments for others is in demand. Not too many people know how to do this. This is a great service for your clients that once they start getting some of their money back they will use your services again and also spread the word by "word of mouth" to others which is the best way to grow your business without advertising. There is also a CD that contains all of the forms, notes, software and documents you probably will ever need. The CD is purchased separately at www.JudgmentCenter.com. Do you want people coming to you with their own judgments to collect? I can create a website similar to this one to collect your own judgment leads. 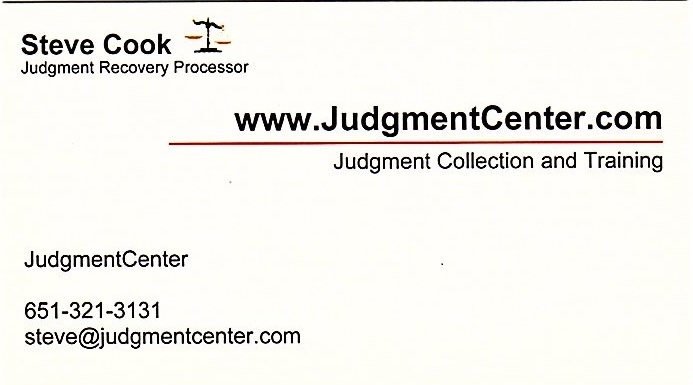 www.JudgmentCenter.com was started in 1999 by Steve Cook who was a landlord who had to sue an ex-tenant. Now Steve operates as a judicial judgment processor in the business of collecting money owed to plaintiffs awarded money judgments and Steve is still a landlord. Founded by Steve Cook who is also the author and publisher of this program. 6) Employee of credit bureau score company for 6.4 years. Later when I talked to another landlord and I told him about my two successful times I won and also collected from ex-tenants he asked me to collect his small claims court award. And that is when I started researching how to collect someone else's judgments without having to get a collection license or permit. In 1997 I started working for a credit bureau score company as a full time employee and I worked there nearly 6.5 years. I learned a lot of ways to find someone and also find their assets. I added this information to my other documentation I have been writing since I first had to sue an ex-tenant. Throughout the years I developed a judgment collection system for myself and for you, upgrading and updating it yearly ever since. My years of experience are now in one nice judgment recovery home study class/course/system. buy now Judgment Collection Training System. Judgment Collection Training Course. 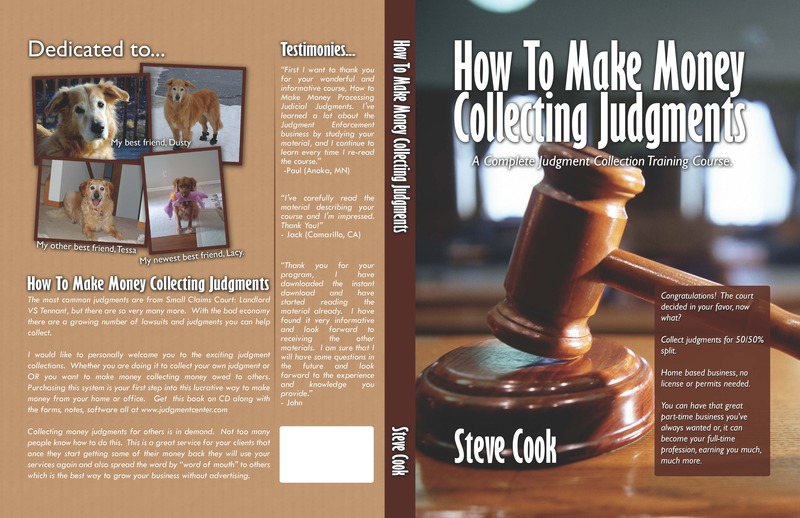 Learn how to collect judgments. Copyright 2018, all rights reserved. No part of this material on any part of the website may be reproduced or transmitted. 3) What is a Judgment? 4) Are there many unsatisfied judgments? 5) How did I start collecting judgments? Copyright 2018, all rights reserved. No part of this material on any part of the website may be reproduced or transmitted without permission. If your order included a download, I will send you an email with a link containing your userid/password within about 24 hours of your order (or sooner). I check the orders every day including weekend. If your order included a CD or Printed manual with CD, I will try to ship it by the very next business day. I will send you an email with the tracking number in it and it will be sent USPS.com Post Office "Priority Mail" with Signature Confirmation, which gives you an added level of security by requiring a signature from the person who accepts your package. judgment collection training course. judgement collection training system. Judgment Recovery is not merely a fascinating home-based business. It is also a much needed service to every community. Isn't that the secret to business success -- finding a niche that is common sense, interesting, and doable, as well as meeting community's needs? You've looked at other Home-Based Businesses, and now you are looking at this one. Why is this business so different? Because every year billions of dollars of court awarded money judgments go uncollected. They are uncollected because the court can't force a debtor pay. And the plaintiff who won the case doesn't know how to make the person pay. However, there are powerful legal and investigative tools available for recovering this judgment money. Judgment Recovery isn't regular "debt collection," because you will actually have a court order that says the person owes this money. And you have legal and investigative tools to locate this money and other assets and seize them. Judgment Recovery is not a "get rich quick" business. If you've been told that, you have been misinformed. If you've seen sites that say "No computer necessary" and "You don't even have to get dressed," then someone is certainly stretching the facts. What are the facts? That Judgment Recovery is a practical business you can jump into or grow into, for either part-time or full-time income. You can make anywhere from $500 a month extra to $5000 a month extra, part time. earning you much, much more. John Creditor is a nice guy. He lends $5000 to his brother-in-law, Bob Debtor, so he can purchase a car. But Bob doesn't pay him back. So, John Creditor goes to small Claims Court and wins a judgment for $5,000.00. He is ecstatic! Now comes the big surprise. Bob debtor doesn't have to pay. John has to make him pay. And John doesn't know how. John turns to you for help. You're the one in your community with the knowledge and skill to do it. What can you do as a Judgment Recovery Specialist? As a J.R. Specialist, you know how to locate where Bob works and garnish his wages, locate where he banks and seize the money, put a lien on his home, and take his car to be auctioned. And, if he has a business, you know how to have the sheriff sit there and collect money form the customers, make his clients pay you directly instead of him…and much, much more. You may be wondering how you get the judgment into your name. After all, you're not an attorney. At first you're not that familiar with courts. Well, every state has a provision where the Original Judgment Creditor (the plaintiff who won the money judgment) can assign the rights, title and interest in his judgment to another person. He can assign it to you. In effect, you now own the judgment. That means you are the new Creditor. Of course there is a contingency arrangement where you return to the Original Judgment Creditor a percentage of what you recovery. Typically that percentage is 40% to 50%. And the Original Creditor is happy to assign it. He's not getting anywhere, and wants you to take over and use your skills. So, using the above case, here's what happens. John Creditor assigns the judgment to you--the Judgment Recovery Specialist. You are now the new Judgment Creditor. You use your skills and special 'private investigator' sites to locate his workplace, and his assets. Using the tools from this course, You then collect the money, and pay John his percentage. Now he's really happy. You keep your percentage, and move on to your next case. I wish I could say that six figures a year is an "easy" six figures, but it's not. It take hard work for that income. And you can make that much only if you have the same motivation and drive that that it takes. If you have less time, you may make less. It's still a great part-time income. This Step-by-Step Course that will take you through to the advanced level . This Step-by-Step Course is the most comprehensive and up-to-date course available anywhere. It is written by me. Judgment Recovery courses have been available for 10+ years. When I started my own business -- I started it as a landlord where I owned 6 hours of which 5 were rentals. I then had a tenant move out and didn't pay their final water/sewer bills so I sued them in small claims court, but they never paid until I garnished their wages from Pizza Hut. Other courses on the internet are tailored only for the beginning phase of your business. A professional Web site "template" for your business. You can literally get up and running in a day. Step-by-step procedures—beginning to advanced—on how to effectively enforce these judgments! Full instructions for setting up a SMART OFFICE—step by step. How to go from part-time to full-time. And should you? Information about which "Private Investigator" databases are the best, and how to subscribe to them. How to create spin-off businesses for even higher income!